Life insurance is one of those things that most people don’t give much thought to until later in life, although we do recommend younger people explore their life insurance options early. 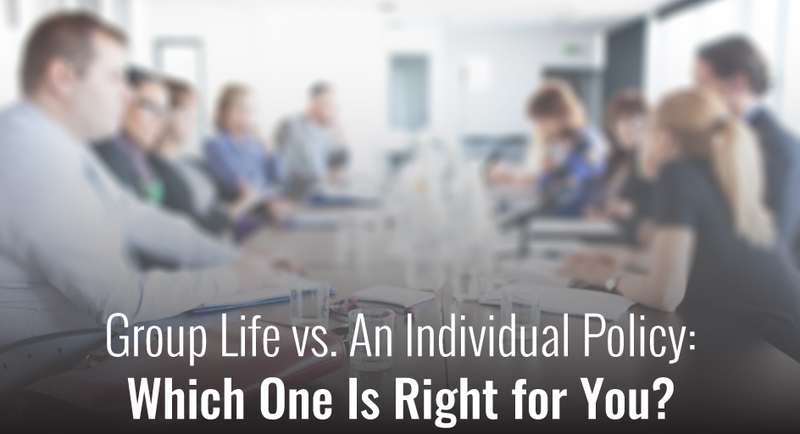 Either way, many people are only on the life insurance policy offered by their place of work. Is that a bad thing or a good thing? Well, that depends. Take a look at some pros and cons of both types below. The base life insurance you receive from your employer is typically 1-3 times the amount of your salary at no cost to you! This is a good cushion for anyone, and a good life insurance plan period if you’re single with no major payments or debts for your beneficiaries to pick up. You also don’t have to go through a medical exam or provide medical records to qualify for coverage on a group life policy, so any preexisting medical conditions won’t count against your premium. However, if you have dependents, your needs will be drastically different. They may need to live on the money from your policy, or pay off your mortgage or student loans, along with using it to pay for a new health insurance plan if theirs was previously covered by your employer. Suddenly, that 1-3 years salary doesn’t stretch very far. In order to cover your beneficiaries properly with your group plan, you would need to pay an additional premium through payroll deduction. With group plans, your premiums tend to be higher because no one on the plan is required to undergo a medical exam. The contract also has to be renewed every 5 years, so it is likely that they will be renewed for higher rates. Lastly, if you ever leave your place of employment, you can’t take your life insurance policy with you. This leaves you and your beneficiaries completely unprotected until you find another job. It is also important to remember that life insurance is a benefit, not a guarantee. If your company needs to make budget cuts, your life insurance policy could be done away with — even if you’ve been paying for additional coverage. An individual policy is just that — it is written for you based on your health and financial goals. Unlike a group policy, you have control over your individual plan and can take it with you wherever you go. You can insure your life for much more than 1-3 times your yearly salary, and know that the monthly premium will be locked in for the duration of the policy so there won’t be any surprise rate increases. You will need to pass a medical exam to qualify, but whether or not this is a pro or con depends entirely on your health. If you are a healthy individual with no preexisting medical conditions, you can benefit from a lower premium. Even if your end premium is higher than what you would pay for additional coverage through your company, your beneficiaries will be insured for much more money in the event of your passing, and you can rest easy knowing that your policy isn’t going anywhere. Barring a small percentage of single people with no major payments or debts, the average person will need to pay some kind of premium in order to be properly covered by their life insurance plan. Our agents understand the ins and outs of these policies, and we are here to help you determine what works. Contact us today to get started on a life insurance plan that is right for you.